Dover, DE (March 15, 2019) – The Delaware Office of Highway Safety, Maryland Department of Transportation Motor Vehicle Administration (MDOT MVA), law enforcement and transportation officials from Delaware, Maryland, and Virginia, have partnered for the second year to save lives on our roadways during the St. Patrick’s Day weekend. Law enforcement from 36 agencies across the three states will team up for a High Visibility Enforcement (HVE) effort on US 13 and US 113 throughout the Delmarva Peninsula. In 2017, there were 39 DUI-related fatal crashes in the state of Delaware and 3,997 DUI arrests. 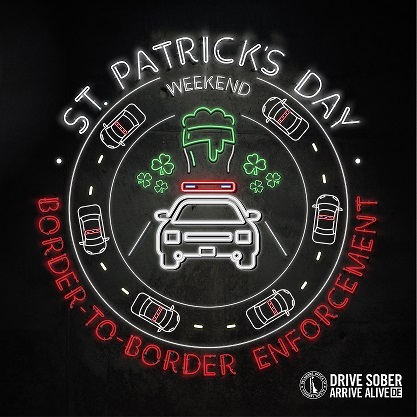 In 2018, there were two DUI-related fatalities during St. Patrick’s Day weekend. Over the last five years, a total of 228 impaired driving arrests occurred for the same holiday period. “All of us here at the Delaware Office of Highway Safety would like to thank our partner agencies for working together to have a greater impact on reducing impaired driving. It is through coordinated efforts like this along US 13 and US 113, that we can increase awareness and safety for all motorists on our roads,” said Richard Klepner, Delaware Office of Highway Safety, Impaired Driving Program Manager. Delaware motorists can text “saferide” to 99000 for a link to download Lyft and Uber apps or get a list of local companies providing safe rides. The state of Maryland is conducting multiple enforcements on US 13 where there were 138 crashes from 2013 – 2016 resulting from alcohol and/or drug impairment. During last year’s effort participating agencies in Maryland issued 125 citations, including 45 for speeding, and made four impaired driving arrests. “This effort is a great example of state and local law enforcement agencies joining forces to save lives on our roadways,” said Chrissy Nizer, Maryland Department of Transportation Motor Vehicle Administration (MDOT MVA) Administrator. In Virginia, there were 278 alcohol-related fatalities in 2018, which is 34 percent of overall traffic deaths. The chance of being in an alcohol-related crash in Virginia is one-in-six over the course of a lifetime. Saturation patrols will run throughout the US 13 and US 113 corridors in the three states with law enforcement on the lookout for impaired drivers. US 13 is comprised of 289 total miles – 137 in Virginia; 103 in Delaware; and 49 in Maryland. It houses approximately 150 establishments with liquor licenses along its length in Maryland alone.